Celtic have confirmed the signing of Denmark midfielder Thomas Gravesen from Real Madrid in a transfer deal believed to be worth about £2m. The 30-year-old has signed a three-year contract, with Celtic having the option of a further 12 months. 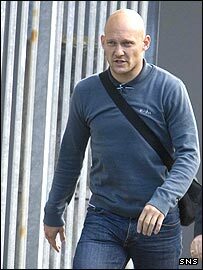 Gravesen said: "I am delighted to have joined Celtic, one of the biggest clubs in the world. "Having spoken to the manager, the chief executive and other people at the club, I am excited about this move." Celtic had faced competition from four English Premiership outfits - Newcastle, Bolton, Middlesbrough and former club Everton - for Gravesen's signature. But he arrived in Glasgow on Monday for contract talks and a medical, only to join up with Denmark's international squad without an announcement being made. Reports of problems resulting from an old knee injury circulated overnight, but the Scottish champions have now announced that Gravesen has signed a contract. "The team did brilliantly last season to win the championship and together we will be trying to retain the title and do as well as we can in the Champions League," he told Celtic's website. "I know other Danish players who have had the opportunity to play with Celtic and they have nothing but great things to say about the club. "I have also visited Celtic Park for matches, where the atmosphere is tremendous, and I am very much looking forward to playing there." The Dane left Everton for Spain in a £2.5m deal in January 2005 but made just 26 appearances for Real. His latest move was confirmed moments after the £6.5m sale of fellow midfielder Stilian Petrov to Aston Villa was officially announced. Celtic manager Gordon Strachan said: "Thomas has shown great desire to play for Celtic and it is very clear that he is looking forward to joining the club. "He is a player with great ability, experience and character - qualities which could enhance any team." And Celtic chief executive Peter Lawwell added: "It is fantastic that we are able to welcome a player of Thomas's quality to Celtic Park." Gravesen will meet up with his new team-mates next week after Friday's friendly against Portugal and his country's Euro 2008 qualifier away to Iceland next Wednesday.